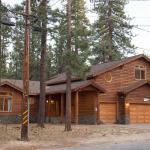 Located 2 km from South Lake Tahoe South Lake Tahoe Chalet offers accommodation in Bijou. The unit is 31 km from Carson City. There is a seating area and a kitchen equipped with a dishwasher. A flat-screen TV is available. There is a private bathroom with a hot tub. Stateline is 3.7 km from South Lake Tahoe Chalet while Virginia City is 50 km away. Reno-Tahoe International Airport is 66 km from the property.